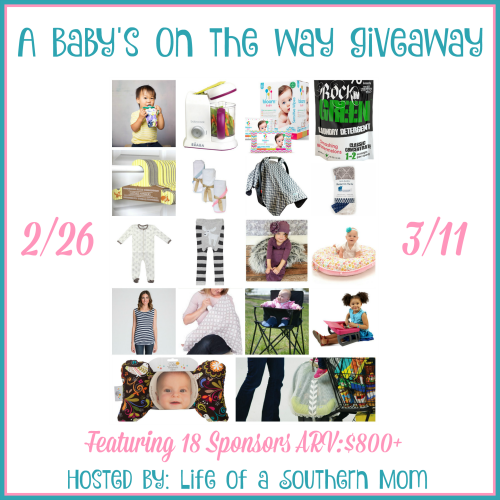 Welcome to A Baby’s On The Way Giveaway! We have eighteen sponsors who have joined up with Life of a Southern Mom to offer one big baby giveaway to one mom and her little one. First let’s give a special thanks to them and visit them on social media letting them know how excited you are about this awesome giveaway. Wow what a great giveaway this is. Us here at Tales From A Southern Mom are so happy to be involved with this spectacular giveaway. The pello is a patented, luxe floor pillow for a child’s ever-changing needs. The distinct, donut-shaped floor pillow has raised edges, ultra-soft plush brushed poly and cotton fabrics and a padded center that benefits a child at all stages of development. It is machine-washable, can be thrown into the dryer, and is durable and portable for mothers on the go. Every pello has two side handles enabling it to be folded in half like a taco and easily portable. Baby Elephant Ears is a baby headrest support pillow providing spinal/neck alignment and comfort – offered in diverse prints and organics, ethically manufactured, and made with sustainable materials. Winner of the Huggies MomInspired Award! Rockin’ Green eco-friendly cleaning products are made for families that care about taking care of themselves and the Earth. They are made with a biodegradable plant-based and petroleum-free surfactant and are gentle on sensitive skin – perfect solution for washing baby clothes. Laundry soap, pet soap, dish soap and more! The Cloud Cover Nursing Cover is a stylish breathable cotton cover that clips to the bra or nursing tank for secure coverage, while providing privacy and comfort for mother and baby. Our award winning product is the perfect accessory for any nursing mother’s diaper bag. Made from a light cotton muslin, the nursing cover is machine washable. The Silkberry Baby Organic Cotton Footed Sleeper is an award winning product with a center front zipper that slides up to open for easy diaper changing and dressing. It features elastic at the ankles for a perfect snug fit and a chin protector on top of the zipper head to prevent rubbing. It is super soft, cozy, and durable! Eco-friendly, beautiful clothes hangers with a slim, space saving profile. Non-slip, with a sturdy and durable recycled paperboard construction. Made with vegetable starch based glues, water based inks and an aqueous surface coating. Designed to fit standard closet rods with a diameter of 1 1/4 inches or smaller. Perfect for clothes sized 1T – 5T, even beyond. The Trendy Tank Nursing Top is the only nursing tank you’ll ever need! The neckline easily pulls down for comfortable and discreet feeding. Then it snaps right back into shape. The wide strap design covers your shoulder straps and side gathers give you a svelte silhouette. Doodle Pants is an exciting collection of quality leggings with colorful patterns, wild animal prints and charming original characters. Little ones (3 months to 3T) can squiggle and wiggle with ease thanks to a roomy seat, stretchy ribbed cuffs and a comfortable elastic waistband. They’re made with thick, flexible material that holds up and is easy to wash.
It’s Time For a Baby Giveaway! I love having someone to love and be a family with. My son makes me feel like I am part of him and part of who he needs. I’m not a mom yet, but have one on the way! I love watching my little ones grow into little people with their own personalities. They surprise me every day! I love all the smiles hugs and kisses. I love getting to share my life with someone who is so excited about every new thing and loves to experience the world!! <3 Such a proud mama! I love how everything is new all over again when you’re a mom. You get to experience everything for the first time again. Plus all the smooches and hugs and laughter and love. Being a mom is the best. I love seeing my daughter smile! I love watching my sons personality develop. We are praying for a #2, but I love my toddler to peices! One thing I love most about being a mom is watching my kids grow and learn, as well as experience things in their views that we as adults have forgotten about as we grow up. I love how my daughter makes me smile and laugh every day. She reminds me not to take things too seriously and to find excitement even in the smallest of things. This would be such a great blessing! Someone is going to be very lucky! Good luck to who all enters!!! I love seeing mydaighter smile! I’m not a mom but I love seeing the bond between a mom and baby. I will be a new mom in June and I love knowing I will get to watch her grow up and watch her every stage of life. There isn’t just one thing I love about being a Mom. I love everything about it! I have only been a mom for 2 weeks and I LOVE it more than I ever dreamed. I love the over-whelming unconditional love I have for our little one and how his smiles and cuddles melt my heart, each and every time! I love being around happy kids and being called “mom”! I love that they learn everything from me but little do they know they are teaching me as well. I have 3 little ones. They range from 6, 2, and 9 months. They learn a little of everything from me everyday and I learn a little more from them what life is all about. I couldn’t imagine life any other way. I love that every day is a challenge!!! Seeing baby smile and laugh always melts my heart. i love the feeling when they’re still in the womb!! Most beautiful butterflies ever!! I love watching my son and seeing the wonder of the world anew through his eyes. I just love the amazing new love you get to experience! I love holding my baby and rocking her to sleep. Having her little blue eyes look up at me and smile is priceless! Seeing my baby smile and interact with the world around her. Plus the cuddles are a nice perk. I’m expecting and have wanted to experience the time of sharing and nurturing a life. I can see the challenges of it, but the rewards of caring for my nieces and nephews have really made me want to have full time experience to share the world with my partner and family. I love seeing my son learn and grow. Having a sweet little best friend and learning what unconditional love is – those are my favorite parts of being a mom! Watching my little one learn new skills (sitting, crawling, etc.) is my favorite thing so far. It will be a whole new adventure!